Australia ACS Assessment is required for evaluating education and work experience. The assessment by Australian computer Society will be used to prove SkillSelect points. ACS Assessment for Australia PR. Fees = AUD $500. Processing time 7-10 weeks. Notarized Passport, Degree, Mark sheets, Work experience letter required. Can Spouse do ACS only for company 1 as role changed for Company 2? 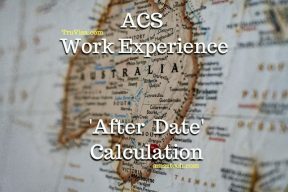 How many years will be deducted by ACS from 5 years experience?